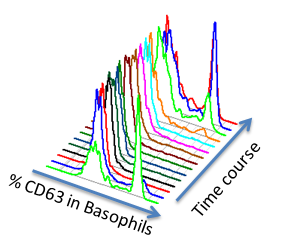 The functional state of an immune cell can be assessed by flow cytometry under normal and pathological conditions. Our comprehensive approach aims to identify signatures of immune protection and therapeutic response. ImmuneCarta offers a qualified CFSE (Carboxyfluorescein Succinimidyl Ester) Assay used to measure and characterize cellular proliferation in response to various stimulations. Additional cell surface and intracellular markers are combined with CFSE staining to assess responsiveness of specific cell subsets. In addition to monitoring cellular proliferation, our CFSE allows us to determine the number of divisions that a cell has undergone in response to clinical treatment or in-vitro stimulations. CFSE analysis depicting a dot plot (A) of proliferating (CFSElow) CD8+ and CD8- T cells and a cell cycle analysis (B) showing the number of cellular divisions within the total T cell pool. 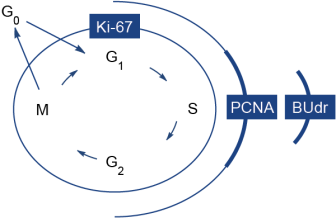 ImmuneCarta uses Ki67 as an early activation marker to identify cells which have entered into cell cycle. Additional cell surface and intracellular markers are combined with Ki67 staining to identify the cell subset of interest along with other functional attributes. The nuclear antigen Ki67 is expressed in all active phases of the cell cycle (G1, S, G2 and M), but is absent from resting cells (G0). Identify cells that have entered into the cell cycle using Ki67 as an early activation marker. Schematic representation of the cell cycle. Nuclear Ki-67 is expressed in all phases except G0 (Resting cell). and at various time points following drug treatment.